Where Is It Flooding ? Pinned. Flood information only please. No politics. great map. That's just what I wanted to see. Suwithawong minburi seems ok now. Heavy rain right now which isnt good. Klum khao rd just from suwithawong to latkrang/romklao is underwater, Thats a no go area if you have to drive. Muang Kanchanburi scattered showers mixed with sunny spells (Christ I sound like a weather girl)! No flooding whatsoever. You mean on the way to the airport from Ramkamhaeng? Thaveewattana Rd Soi 9: Everyone nervous but no flooding yet. Suanam Luang 2: the waste water tubes seem to be complete full. 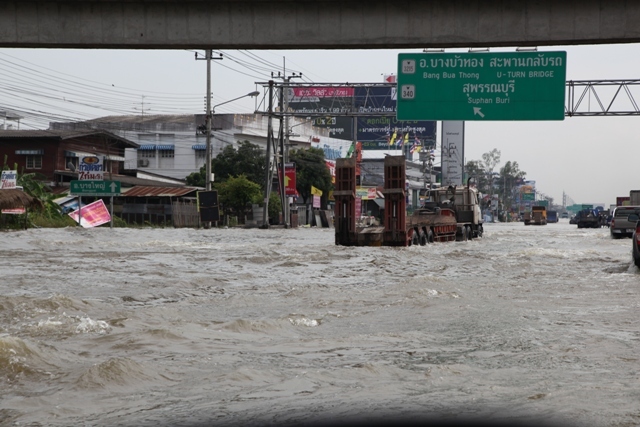 Flooding in the Bang Mot area south of Thonburi on the west side of the river. This is in the "safe zone", but the water started to rise around midnight and klongs are now overflowing some roads. Friday west of the river heading for Bang Bue Thong. friday between Ang Thong and Maharat. Almost 20km's of road under water. 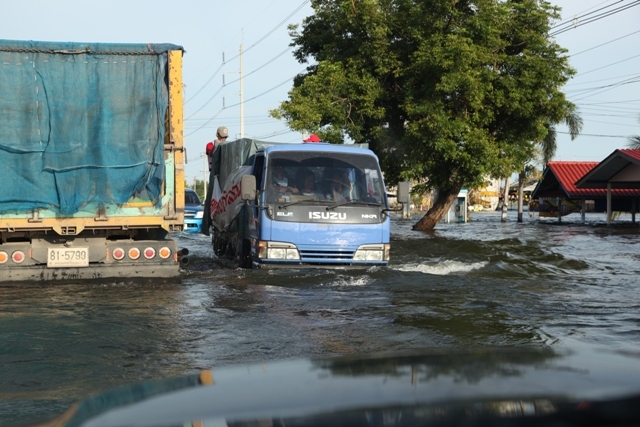 Slight flooding yesterday on the 340 BKK to Suphan Buri. No that rd is ok but everything to the left is flooded. Its like a back rd/short cut to lat krabang, romlkao and the airport.from suwithawong. 4 km down the road from Big King Bangjay the road is flooded more then the days before. Its a good 5 cm deeper. Only the middle fast lane (not sure how to call the seperate road in the middle) has not been flooded. It looks like i have been cut of from travel.